The Khyber series boot has been an extremely popular boot amongst law enforcement since its release several years ago. Now the Khyber series is available for military personnel in several colors. 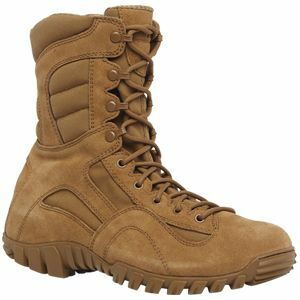 The Tactical Research TR550 Khyber Men's OCP ACU Coyote Brown Hybrid Assault Boot was designed for hot weather use. From rocky mountainous terrain to hard pounding concrete roads, the NEW Coyote Khyber TR550 will allow you to perform to your potential whatever the setting. This hot weather mountain hybrid boot was specifically designed for all-terrain use and features a heel and toe kicker for climbing walls and slowing you down on mountainsides. With great design comfort and durability features, such as its lace-to-toe lacing system, the TR550 has a customized fit and is a top choice for military professionals. The TR550 is AR-670-1 approved for wear with the U.S. Army's ACU OCP.